A dream home has turned into a nightmare for a Nova Scotia family, who is now stuck paying the mortgage on the home almost two years after it was swallowed up by a sinkhole. “It's kind of remained a hellish journey for us,” homeowner Chris Strickey told CTV Atlantic. Back in September of 2017, a sinkhole opened up under the family’s house. Heather Strickey remembers being woken up by strange sounds the night of September 3. As they waited, huddled together for almost 30 minutes as windows broke and the power went out, for police to arrive, a 911 operator broke the news to them. Initially optimistic that insurance would cover them, the family found out that their contents were covered, but not their home. “As our house was falling into that hole, all I could think was ‘we’re OK’…things can be replaced, we will move on from this,” Strickey said. It took 72 days for their insurance company to respond to the request for coverage. Ultimately, their claim was denied. The blow was compounded by the loss of her husband’s mother to cancer shortly after. As a legal battle continues to resolve the claim, the Strickeys are stuck paying the mortgage on a home that no longer exists. “We’re still paying for a house that doesn’t exist, so we can’t afford to ever own a home again unless we get insurance to cover our lost home,” she said. Facing ongoing financial strain, their friends, family and employers gave them some much needed support. After short stays in three different homes, the family has settled into a residence on the grounds at their workplace, King’s Edgehill school in Windsor, N.S. They are serving as house parents to five Grade 12 girls who live on campus. It’s the same residence they called home when they were first married and had their two daughters. “There's been very difficult, challenging times, but also absolutely put the spotlight on the kindness and the empathy of a lot of our friends, neighbours and colleagues,” said Chris Strickey. 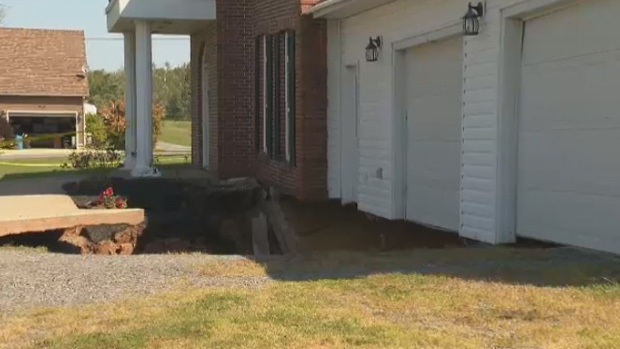 A home in Falmouth, N.S., has to be demolished after a sinkhole formed in the soil underneath.